The 2019 Crop Insurance Decision Tool is now available here in the FAST section of farmdoc. This Microsoft Excel spreadsheet contains seven tools that can be used to evaluate different Federally-offered crop insurance policies. One of the most used tools is the IFARM Premium Calculator. Figure 1 shows the Premium Calculator. The quote is for corn in Sangamon County, Illinois (see box in upper left corner). The Premium Calculator gives quotes for most states state in the Midwest, South, and Great Plains. APH Yield — history of yields with substitutions in specific cases for Yield Exclusion (YE) and t-yields. TA/YE adjustment — adjustment for trend-adjusted yields (TA) and Yield Exclusion (YE). TA Yield — trend-adjusted yield based on a history of yields adjusted for trend. Rate Yield — based on a history of yields. In many cases in the Midwest, the APH Yield equals the Rate Yields. A “TA/YE” sheet is available to calculate the APH, TA, and rate yields for specific cases. Rate class — input for standard and high-risk farmland. After a county/crop combination is selected, the input will default to the most used practice within in county. The APH, TA, and rates yields will be set based on historical county averages. Quotes for individual farm policies include Revenue Protection (RP) and Revenue Protection with the harvest price exclusion, and Yield Protection (YP). These quotes are given for available coverage levels and for enterprise, basic, and optional units. Quotes for county level products are given in the lower-middle panel. County level products include Area Revenue Protection (ARP), ARP with harvest price exclusion, and Area Yield Protection (AYP). These are given for available coverage levels for the range of protection factors. The lower panel gives quotes for Supplemental Coverage Option (SCO). SCO will provide a band of county coverage from 86% down to the coverage level of an underlying individual policy. Suppose a farmer buys an RP policy at an 80% coverage level at $11.03 per acre (see Figure 1). This individual could purchase an SCO coverage from 86% to 80% for $2.83 per acre, giving a total farmer-paid premium for the RP and SCO product of $3.86 per acre. Some individuals who want additional coverage above an 80% RP policy but do not want to pay $21.35 per acre for an RP 85% coverage level could purchase the RP-SCO combination. While lower cost, the RP-SCO coverage does not provide the same coverage as RP 85% coverage. To be eligible to take SCO, the farm must be enrolled in Price Loss Coverage (PLC) as the choice for the commodity title program. Under the 2014 Farm Bill, most farms in the Midwest were enrolled in Agricultural Risk Coverage (ARC) and therefore SCO was not available. Under the 2018 Farm Bill, more farmers may enroll in PLC and become available for SCO. All quotes in Figure 1 are based on a $3.96 projected price and .15 volatility, last year’s projected price and volatility. The 2019 projected price and volatility will not be known until the first of March. These parameters can be changed under the “Parameters” button. An update feature is available to update parameters. Once the end of February comes, the update feature will give the final 2019 values. Final 2019 premiums will not be known until the 2019 projected prices and volatilities are known. Given the same parameters in 2019 as in 2018, most farmers will find slight increases in premiums in 2019. At a $3.96 projected price and .15 volatility, the RP 85% policy at the enterprise level has a $12.83 farmer-paid premium. Last year, the same policy had a cost of $12.31, lower by $.52 per acre. An inspection of several counties around Illinois suggests that similar increases occur. Soybean premiums also increase. The increases seem ironic given the low loss experience of recent years. 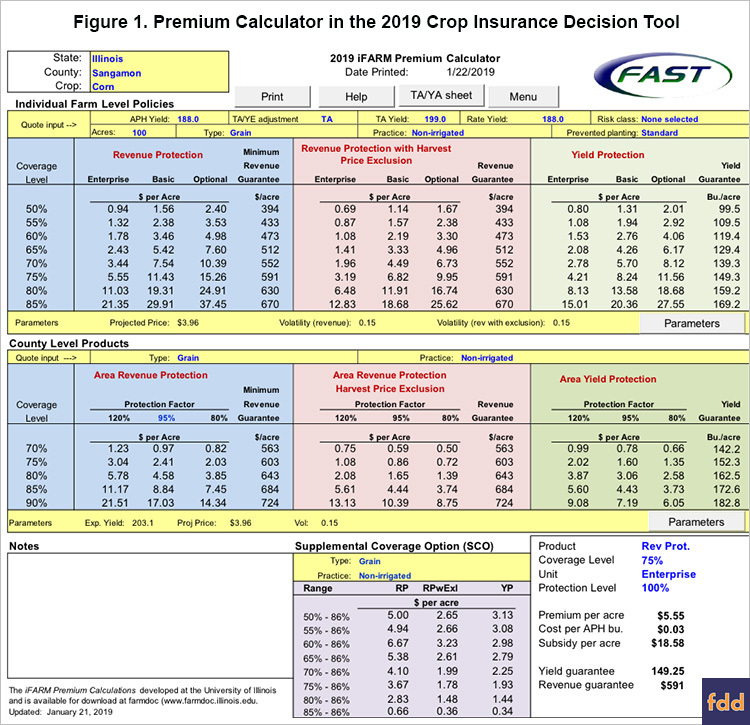 The 2019 Crop Insurance Premium Calculator is available for download in the FAST section of farmdoc. Rates have changed, resulting in slightly higher premiums in most counties of Illinois. My guess is that most farmers will not find the premium increases overly burdensome such that changes in crop insurance buying behavior occur.